Herb Supplement For Increasing Milk Supply - ORDER HERE! Free Detailed Instruction Sheet for Increasing Your milk Supply will be sent along with your purchase! This Herbal Supplement is designed to increase your milk production. It is important that thorough emptying of the breast be done for it to be most effective. The free instruction sheet should also be of great value to increase your supply. Suggested use: 1 capsule 4 times daily. For body wt. 175 lbs and above, take 2 capsules 3 times a day. 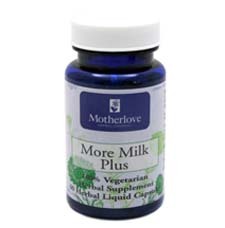 Motherlove's best-selling More Milk Plus formula is now an alcohol free liquid concentrate in vegetarian capsules. 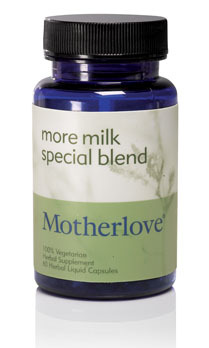 A safe and effective herbal formula designed to quickly increase breast milk. This product does not contain any milk, dairy, egg, fish, shellfish, tree nuts, peanuts, wheat, or gluten. Take 1 capsule 4 times per day. Women over 175 lbs take 2 capsules 3 times per day. May be taken with 1-2 oz. of liquid. Avoid additional liquids 15 minutes before and after each dose. More Milk Plus Special Blend is specially formulated at the request of Lactation Consultants. This alcohol-free blend of More Milk Plus with Goat's Rue helps women with special needs -- such as Polycystic Ovarian Syndrome (PCOS), breast reduction surgery, adoptive moms and for women with little breast enlargement during pregnancy -- to build mammary tissue as well as to safely and effectively increase breast milk. This product does not contain any milk, dairy, soy, egg, fish, shellfish, tree nuts, peanuts, wheat, or gluten. Not for use during pregnancy.